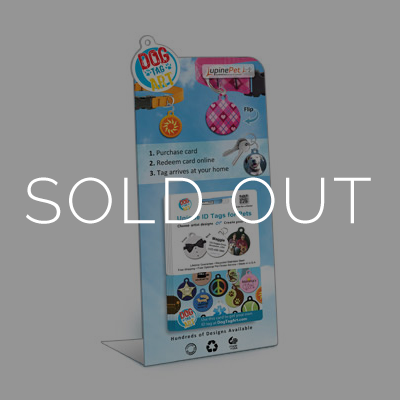 Now you can sell Dog Tag Art tags in your store or retail space! We supply you with an attention grabbing gift card counter top display and pre-paid scratch off cards. 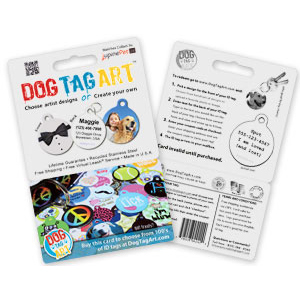 Your customers then purchase the cards and use the scratch off coupon code on the back to order one "free" custom engraved dog ID tag, which includes shipping, on the Dog Tag Art website. • No forms to fill out and fax in. • No expensive dog tag machine. • We take care of everything after the sale including the Lifetime Guarantee that comes with every tag sold. Our rugged gift card counter displays look great on any counter top and contain all the information needed to make a sale. They feature full-color graphics and are constructed of durable metal. Included with every counter-top display are sample tags which allow customers to see and feel the tags. The samples are mounted on metal rings so they can also lift each tag to view the example personalized text on the back. Each display also includes a folding metal rack that can hold multiple gift cards as well as a clip on the back for holding brochures. 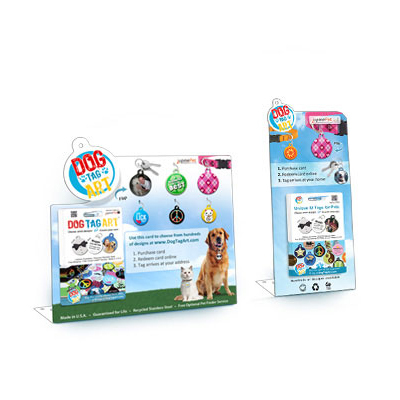 • Our large display measures 11.5" by 9" and includes 6 eye-catching sample tags and a tab on the back for holding brochures. • Our small display measures 5.25" by 11.5" and includes 3 eye-catching sample tags and a tab on the back for holding brochures. 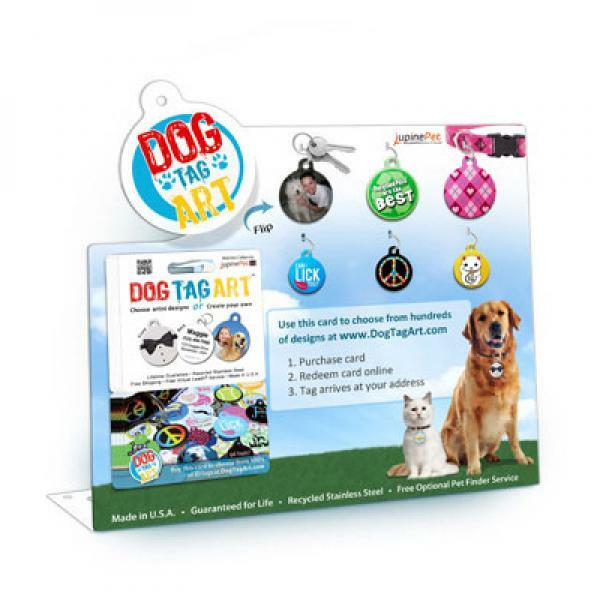 Each Dog Tag Art Gift Card is good for one custom engraved dog ID tag with free shipping from our site (MSRP $16.97). Each card contains detailed instructions on how to redeem online using the scratch-off coupon code on the back. They are made of quality material and look great when hung on our counter top display. Please allow 1 - 2 weeks for your display to arrive. We ship via USPS Priority mail for $12.00. The actual tag samples on the display may vary. Limit one Display per Retail Store location.